Tag line: "The worms are waiting"
This film's poster is classic: a skeletal-faced woman, wearing only a nightgown, holds aloft the severed head of a man. 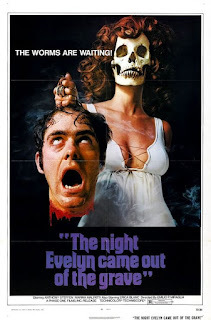 It’s a gruesome bit of artwork, to be sure, but not even a display as horrific as this will adequately prepare you for what The Night Evelyn Came Out of the Grave, a 1971 Giallo / Gothic horror movie directed by Emilio Miraglia, has to offer. British aristocrat Lord Alan Cunningham (Anthony Steffen) has been an emotional wreck since the death of his beloved wife Evelyn (who, it turns out, had been cheating on him for quite some time). Haunted by her memory, Alan lures red-headed strippers and prostitutes (the same hair color as Evelyn’s) to his dilapidated castle, where he ties the poor girls up, whips them unmercifully, and, believing them to be the reincarnation of his unfaithful late wife, murders them in cold blood. His good friend, Dr. Richard Timberlane (Giacomo Rossi Stuart) has tried to convince Alan to seek professional help, and has even suggested that he get married again, in the hopes a new bride will take his mind off his past troubles. Alan does eventually follow Richard’s advice and marries a beautiful blonde named Gladys (Marina Malfatti), who he met at a party his cousin George (Enzo Tarascio) dragged him to. After paying a small fortune to renovate his family’s castle, Alan and Gladys take up residence there, and with the help of his Aunt Agatha (Joari C. Davis) and personal assistant Farley (Umberto Raho), both of whom are close by at all times, Alan is finally able to put the past behind him. But when his new bride spots a red-headed woman wandering the halls at night, Alan starts to believe his late wife has returned from the grave, an eventuality that, if true, could very well push him to the brink of insanity. The Night Evelyn Came Out of the Grave is, at least in part, a Giallo film, presenting a very intriguing murder mystery (with plot twists aplenty) that gets more complex as the movie progresses. Soon after Alan remarries, people start to die, often in violent fashion (one victim, after being bitten by a poisonous snake, is buried alive in a fresh grave, the dirt hitting their face as they gasp for air). We have no idea who is committing these murders (it might be Alan himself), and this central mystery keeps us guessing until the very end. 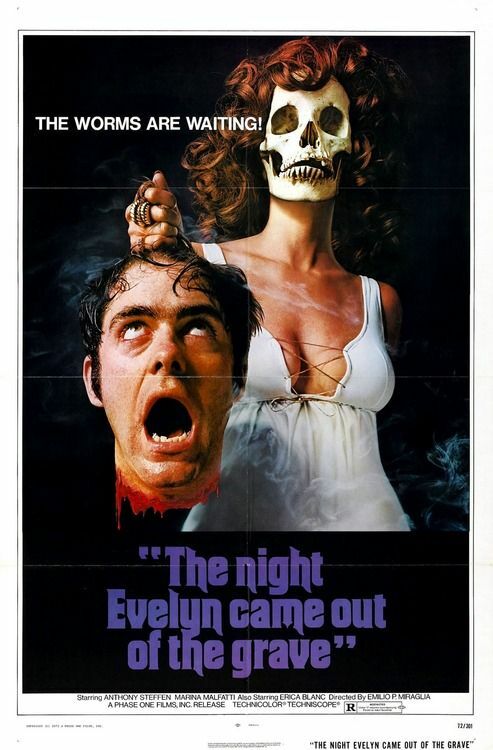 Along with its mystery, The Night Evelyn Came Out of the Grave has all the makings of an excellent Gothic horror film, thanks in large part to the superior set pieces designed by Art Director Lorenzo Baraldi. Early in the movie, the Cunningham castle is a dank, abandoned building, with cobwebs filling the empty spaces in many rooms (even after the estate has been restored, there are scenes set in an underground crypt that keep the Gothic atmosphere alive). The film also has its share of supernatural elements, resulting in moments so profoundly creepy they’ll make the hairs on the back of your neck stand at attention (aside from a well-staged séance, in which Alan attempts to contact his late wife, he has several encounters with what we are led to believe is Evelyn’s ghost). The Night Evelyn Came Out of the Grave features psychological terror as well, with Alan so distraught over the death of his wife that he himself becomes a killer (it’s to the filmmakers credit that, over the course of the movie, they somehow manage to transform Alan from a beastly murderer into a sympathetic character). Thanks to its various elements, all juggled wonderfully by director Emilio Miraglia, The Night Evelyn Came Out of the Grave is a film that’s overflowing with creativity, and even if some of its plot twists leave you scratching your head (a few don’t make a lick of sense), the journey itself makes this movie a rewarding experience.